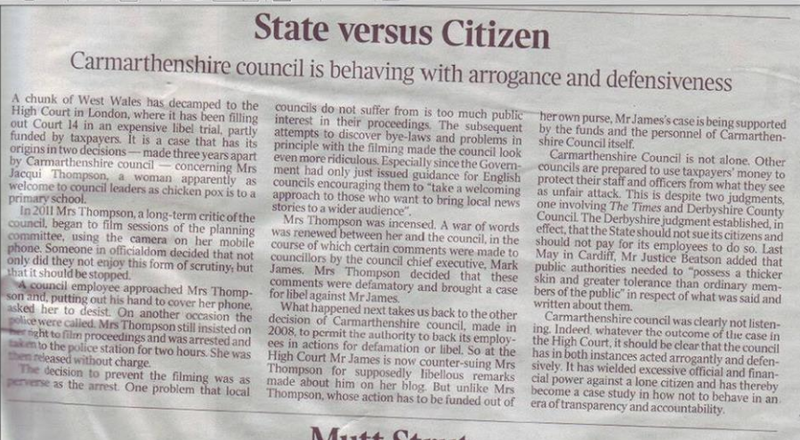 The article pictured above appeared in the Western Mail last week, it's not online but please click to read in full. 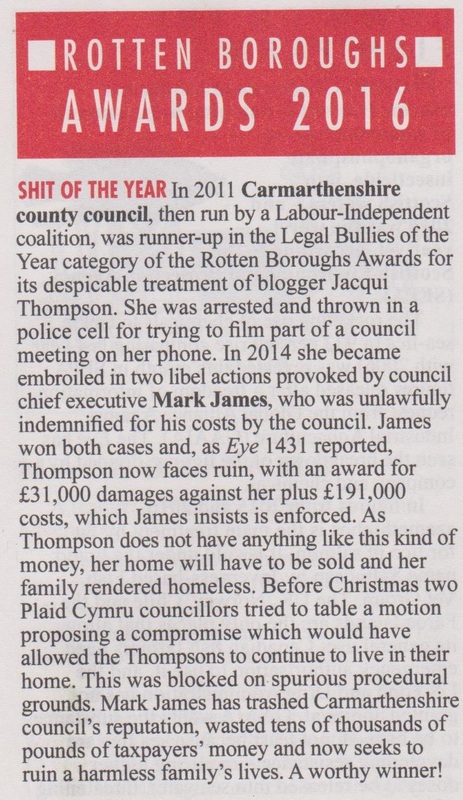 The piece carried two statements, one from council leader Emlyn Dole (Plaid), currently competing for votes for the council seat of Llannon, and one from Mark James' solicitors. I would like to make a few observations concerning both statements. Emlyn Dole states that the 'gutter' comment was an "insensitive off-the-cuff remark made on the spur of the moment by his [Mr James'] legal counsel in reply to an inquiry by the judge.” The implication being that it is clearly of no consequence, it is unimportant. I have no doubt that the comment came as a shock to Mr Dole, as much as it did everyone else, including me, but Mr Dole was not in court. During the hearing, before adjourning for lunch, the judge asked for information regarding the promise by Mr James to hand over any damages. We both had an hour. Within ten minutes I had found the report with the relevant clause, emailed it to the court staff from my phone, and they kindly printed it out, let me highlight the clause and had it on the judge's desk within minutes. Mr James' expensive brief (£3500 for the day) also had an hour to take instructions or at least come up with a decent response to the judge's enquiry. The response, for which Mr James has forked out a total of £22,000 (£14k now payable by me) for, was that he'd changed his mind' and could stuff it in the gutter. 'Off the cuff' remarks are an interesting concept when it comes to the legal world. 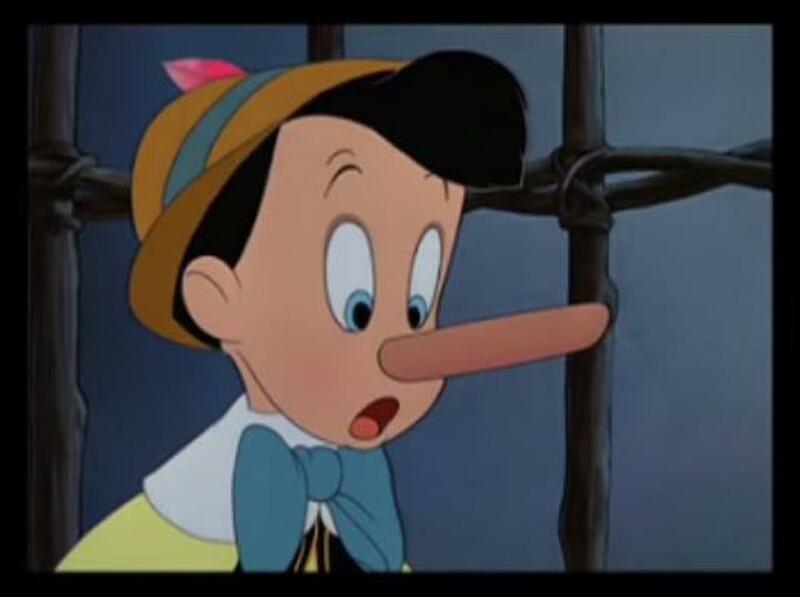 'Pinocchio' and 'slush fund' were off-the-cuff, would Mr Dole agree? And comments I have made about not paying Mr James a penny were regarded by the judge on the 23rd March as said in the heat of the moment. off-the-cuff. And what about words said by your barrister on your behalf? My barrister, during the libel trial and during the cross-examination of Mr James referred, carefully, to the '£5000 in the brown envelope' episode. That line of questioning, was included by Judge Tugendhat in the extra £5000 aggravated damages awarded to Mr James, it was deemed as too upsetting for the CBE holder. I was liable for it. I acknowledge that Mr Dole had no part in the unlawful decision to indemnify Mr James in 2012 although it was common knowledge that the Plaid group leader at the time, Peter Hughes Griffiths was keen for it to go ahead. There was no comment from Mr Dole until Mr James was rumbled by the WAO in 2014, over both the libel indemnity and the pension tax avoidance scam. During that time I was even contacted by a senior Plaid source stating that they were 'after Mr James' blood'. By June 2015, and now council leader, Mr Dole suddenly became 'unaware' of any unlawful payments; selective amnesia seemed to be a pre-requisite for power in County Hall. I have no problem with Plaid as a party, nor any other party (all are good in parts, bad in others and to be taken with a pinch of salt at elections time), and I think Jonathan Edwards and Adam Price are decent constituency politicians. I believe they have been badly let down by the Plaid leadership on the council. Aside from Mr Dole getting some 'off-the-cuff' planning permission, the episode before Christmas when Plaid councillors tried to broker a resolution to my impending homelessness through public debate illustrated the point well. The Motion, engineered by Adam Price, was blocked by Mr James under spurious threats of 'contempt of court'; it was a 'private matter' and all that nonsense. Mr Dole was silent on the subject despite his councillors coming under flak and even having to remove statements from social media. Mr Dole showed plenty of leadership when he and his executive board decided to pursue me for £191k but precious little when confronted by the arrogance and bluff of Mr James. Clearly, Mr Dole's everso polite invitation in the Western Mail for Mr James to consider handing the damages over (once his costs have been recouped...) shows that the word 'private' never came into the equation. It also shows we're right in the middle of an election. Don't think for one moment that this lets Labour, or the Independents off the hook. Kevin Madge, an original member of the Exec board which approved the unlawful blank cheque, and the pension scam, is standing for re-election in Garnant. The current Labour group leader, Jeff Edmunds, has not said a word on the subject. Meryl and Pam have, as we know, finally hung up their Official Civic Broomsticks to retire on their generous councillor pensions. Now I move on to the statement from Mr James' solicitors which I find remarkable. And if I didn't live in a bungalow I'd be heading to the foot of our stairs. "The matter of what Mr James might do with the damages, as and when he finally receives them was irrelevant to the purpose of the enforcement proceedings. 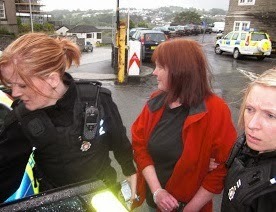 On the day of the hearing, Mr James' solicitors were unable to take instructions and confirm his position to the court. 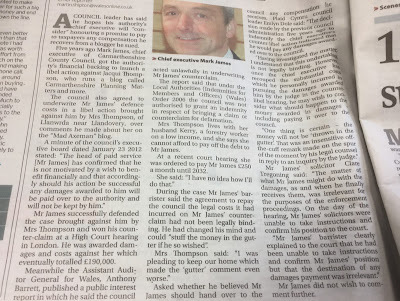 Mr James' barrister clearly explained to the court that he had been unable to take instructions and confirm Mr James' position but the destination of any damages payment was irrelevant"
There are two issues here. I clearly heard the barrister say he had taken instructions, who from is not clear, and neither does it matter. Mr James had been dishing out instructions for twelve months. What was said was said, as I have pointed out above. The second point concerns the matter of irrelevance. 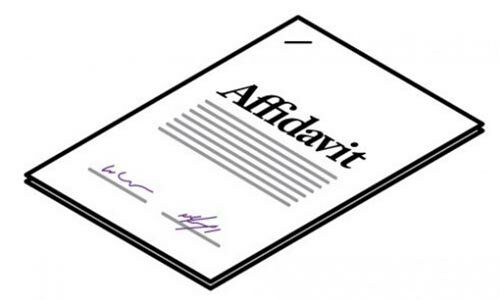 An average forced sale hearing should cost no more than £2000 to £4000 and take, at most, a couple of hours. They wanted a whole day and Mr James managed to rack up £22,000 of complete irrelevance. I went to the hearing prepared to defend the forced sale of my home with a two page skeleton argument. 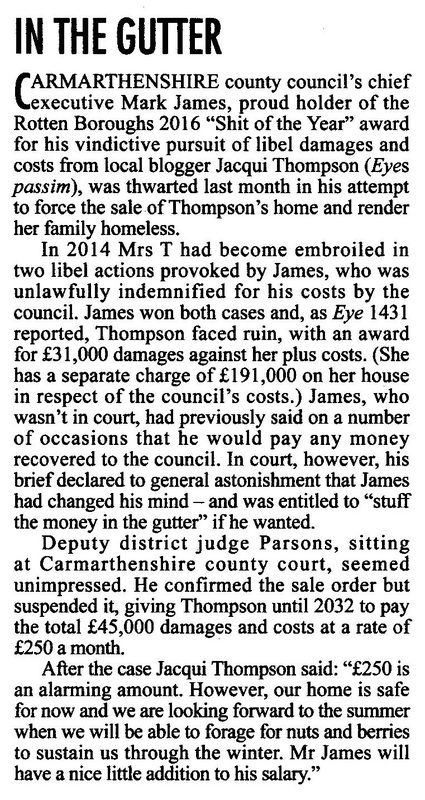 Mr James had clearly instructed his solicitors that an extensive character assassination of Llanwrda housewife Mrs Thompson was absolutely necessary and crucially, relevant. The judge did not seem to think so. Mr James had, in the course of the enforcement proceedings instructed no less than three barristers, one being Mr Adam Speker, his media lawyer from the libel case (his costs disallowed by the judge). The 250 page court bundle had, unbelievably, cost £1100 to cobble together, a hundred and odd pages of which was Tugendhat's original judgement. The two page Court Order from the trial would have sufficed. Mr James' lawyers, despite the fact that they had not been properly briefed about Mr James' broken promise, clearly expected a slam dunk victory and the keys of the house safely in Mr James' pocket by 4pm. This was clearly based on the instructions he had given them and the irrelevant documentation they had been supplied with. It turned out, of course, that the court felt that Mr James' intentions, and indeed his motives, were highly relevant. There is another way of looking at this. If Mr James felt he was on shaky moral or legal ground, Derbyshire-style or otherwise, and that the unlawful circumstances which gave rise to the damages were casting a niggling doubt over his actions and motives, then what better way to counter it than to go on the attack with as much irrelevance as he could muster. The article states that I have been ordered to pay him £25,000 by 2027, it is actually £45,000 by 2032. 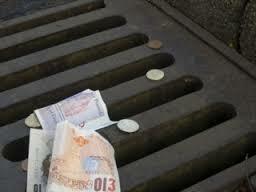 I am to pay monthly instalments of £250., somehow or another. Is there a stenographic record of the court proceedings? They seem to be backpeddling on their gutter comments. I understand the hearing was audio recorded. Yes, part backpeddling, and part avoidance. Could not the council have ordered you to stop writing your blog and have the entire archive removed and asked you to apologise? Why did they insist on pursuing you for outrageous amounts of money and employing expensive lawyers when, surely, they knew you were of limited means? To answer the first part, given the circumstances, and the nature of the litigation it's all little more complicated than that. As for the second part, I have no idea; Mr James' relentless pursuit of the money appears to know no bounds. Maybe Cllr Dole would like to enlighten us as to the source of the advice that “this undertaking is not legally binding”. We can have a good guess where that view came from and be pretty certain that it won’t have been from any truly independent legal source. However, it’s reassuring to see that he accepts the premise that the Council should be at the back of the queue in regards to payments owed to them. Should we all now do as he suggests and only consider paying council tax after first paying other household outgoings such as mortgages, water and electricity bills?